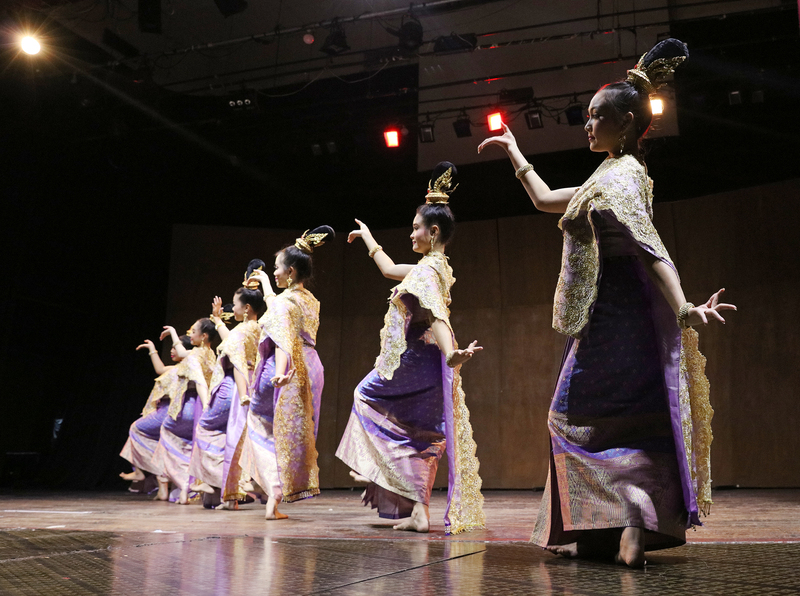 A 35-person team of performers and faculty members from Thailand’s Angthong College of Dramatic Arts showcased traditional Thai dances at the University of the Philippines Diliman’s (UPD) Abelardo Hall Auditorium on January 22, 2019. The event was made possible through the cooperation of the UP Office of the Vice President for Public Affairs, the UP Office for Initiatives in Culture and the Arts (UPD-OICA), the UP College of Arts and Letters, The UP College of Music, the UP College of Mass Communication and the Royal Thai Embassy. This performance was held to commemorate the 70th anniversary of diplomatic relations between Thailand and the Philippines. It was attended by: H.E. Vasin Ruangprateepsaeng, Thai Ambassador to the Philippines; Minister and Deputy Chief of Mission Urawadee Sriphiromya; First Secretary Thassarany Noivong; and, other guests from the Royal Thai Embassy in Manila. UP’s contingent was led by Vice President for Public Affairs Elena Pernia and UP Diliman Chancellor Michael Tan. The dancers from Angthong College began their performance with a rendition by two dancers of The Pursuit of Supanna Matcha, from the khon (masked dance-drama) performance of the Ramakien or the Thai Ramayana. It was followed by Natnaree Sri Ayothaya, which was a tribute to the beauty of Thai women and the delicate style of Thai dancing. Finally, the group ended by dancing the Rum Wong, a slow round dance where dancers move in a circular manner and with both male and female dancers participating. The second half of the event featured a performance by UP’s own Kontemporaryong Gamelan Pilipinas (Kontra GaPi). A rousing climax to that performance saw both Thai and Filipino participants, including UP officials, dancing together onstage to signify the unity and optimism of the representatives of both nations. “Our countries are often referred to as twins,” said Vice President Pernia, referring to the Philippines and Thailand, “experiencing similar political and social issues over these many decades.” Beyond economic relations made salient by ASEAN integration, Pernia noted that it is in the realm of culture and the arts that enjoyable representations of both people’s values and aspiration were to be found. The event, therefore, Pernia added, was an important step towards understanding how, despite linguistic and cultural diversity found in the ASEAN Economic Community, both countries are committed to maximizing opportunities for mutually beneficial regional integration. Photo3: 3Q2A4887: ‘UP Vice President for Public Affairs Elena Pernia (left) and H.E. Vasin Ruangprateepsaeng. Photo by Misael Bacani, UP MPRO’. Chancellor Tan, on the other hand, stressed the importance of more student exchanges at the undergraduate level between Thailand and Philippines. He publicly requested Ambassador Ruangprateepsaeng for assistance in finding more experts from Thailand who could teach both Thai music and language to interested students in Diliman.